This morning, we left the house with plans to check in Rigby for fresh fruits and vegetables markets. We took the long way around (not the highway) to see if anyone had any roadside signs that said they were selling fresh eggs or other items. We found none. When we got to Rigby, we stopped at Auntie Annie’s Antiques. Big mistake. $64 dollars later, I had an upset ex #1 and quite a few cookbooks in my hands. 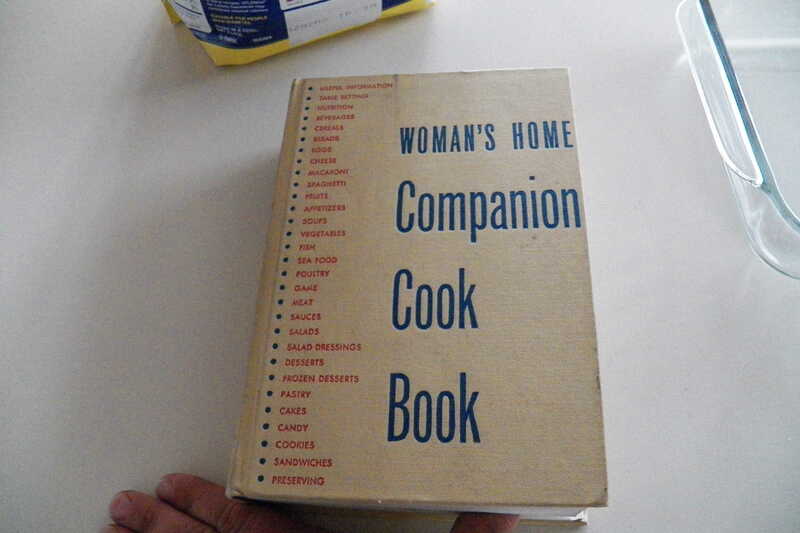 I bought “The General Foods Kitchens Cookbook” dated 1959; “Woman’s Home Companion Cook Book” dated 1955; “Betty Crocker’s Guide to Entertaining: How to Have Guests – and Enjoy Them” dated 1959; and even a book titled, “Helping Children Develop Moral Values” dated 1953. 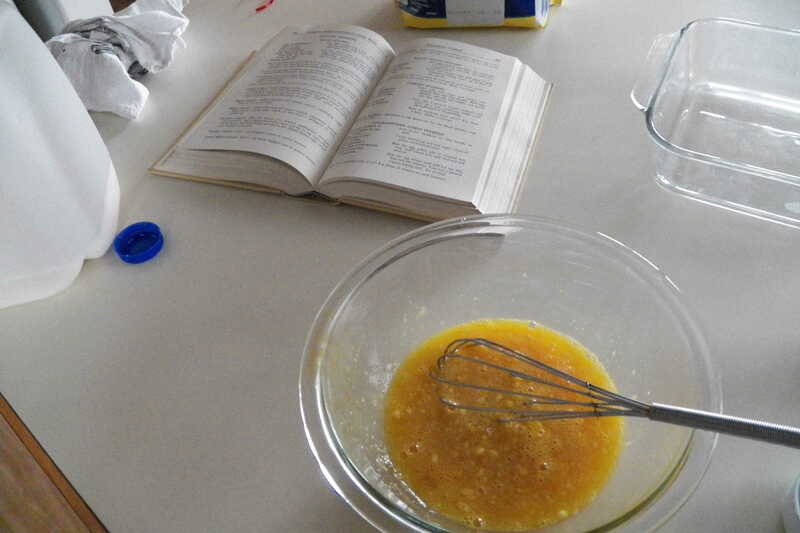 I looked in this book and found a recipe for custard. 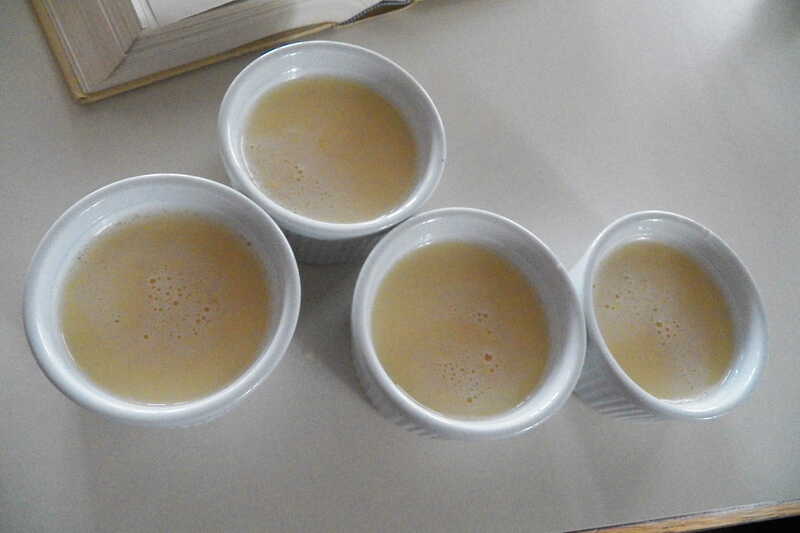 I tried it; substituting Splenda for sugar, accidentally pouring too much vanilla into the bowl and *not* following the directions about placing the custard cups in a pan of water. 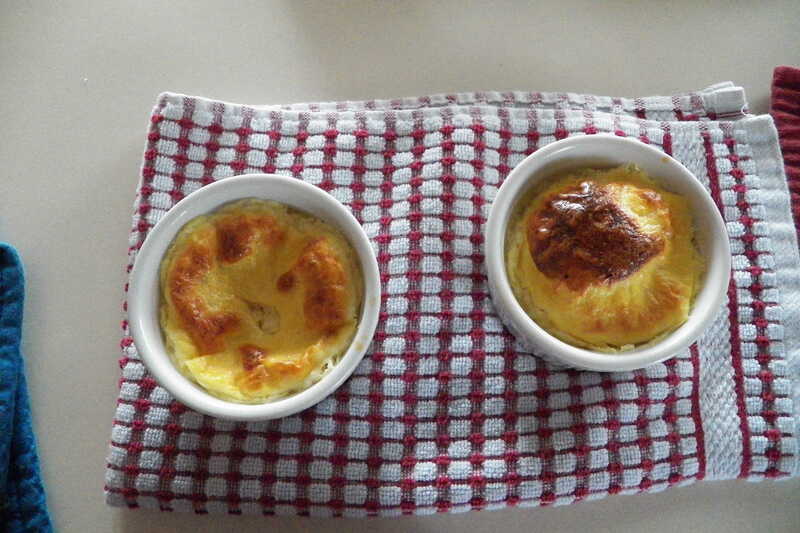 Instead, I used my ramekin cups, hoping it would turn out. I’m not sure which part failed – the Splenda, the vanilla or the ramekins. It took over an hour to cook, wasn’t as smooth as custard should be (in my opinion) and nearly made me sick from how sweet it tasted. Even my boys wouldn’t finish theirs. The Nanny did, bless her heart. She says it tastes good but I think she’s scared to tell me I failed at something. Oh, well. I have plans to try again and see which part failed. I will cook in the water, not spill the vanilla into the bowl and use Splenda to see if that helps. I’ll let you know! 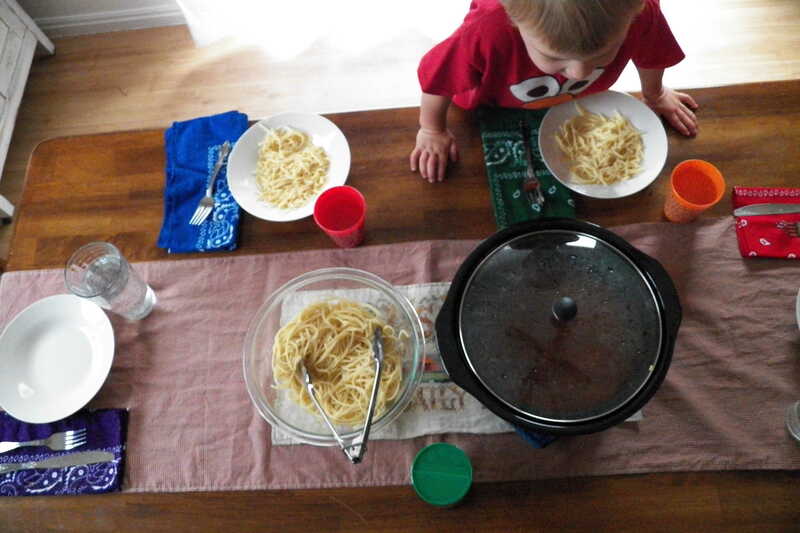 For dinner, we had my specialized spaghetti sauce – guaranteed to change anyone’s mind about NOT liking spaghetti. I’m serious! I have converted at least 3 people, to date, by forcing them to, at least, try mine before deciding all spaghetti is nasty. The red gingham table runner you see is actually another of my purchases at the antique store, today. I like it and it suits the “country” dining room I am creating. I used to have leather on my table – a piece I cut back in (probably) 1993 or thereabouts and have used on my table since. 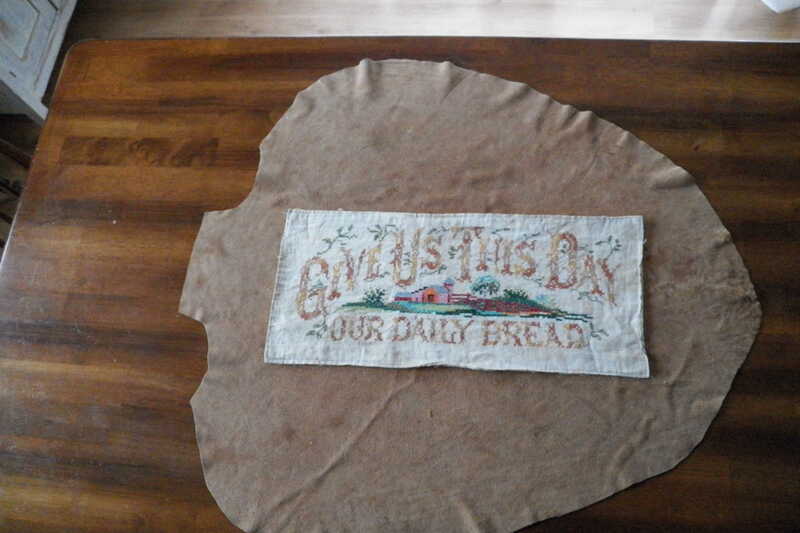 The top piece is actually a saying: “Give us this day our daily bread.” Growing up, no matter where we lived, we always had a breadbox that had that saying on it. Everywhere we went, it was there. Most times, it sat on top of the fridge (in every house I recall) with bread in it. It became a part of what I remember about my childhood. Back in 1992/3/4, I found that topper at an antique store and saved it. Eventually, I stitched a backing on it because I didn’t want it to get ruined and I wanted it to be washable – even though it is all hand cross-stitch/embroidery. It’s beautiful and because it has the same exact saying on it as that breadbox, it is a treasured item of mine. The leather I cut into the shape of an arrowhead. At one point in my life, my entire house was decorated with a Native American flair. It has since whittled down and I have a few nice pieces but not an overwhelming number anymore. This piece of leather has always been on my table and I have washed it a few times (with success). 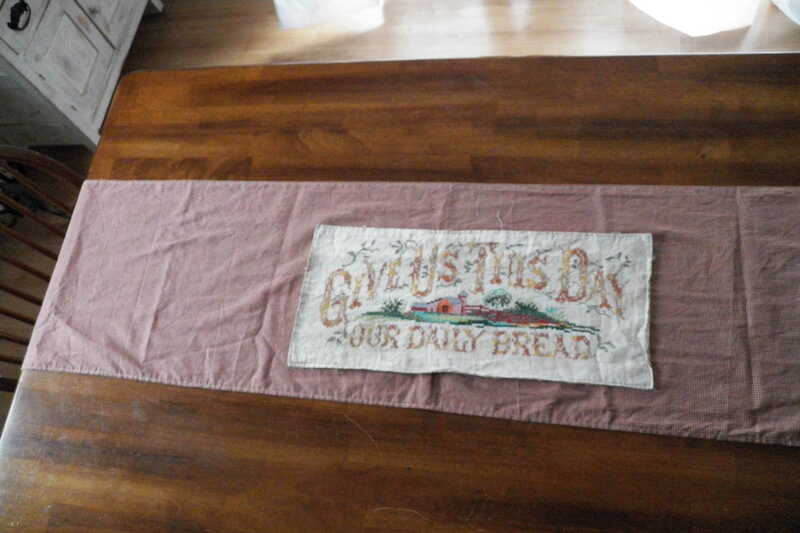 Today, it finally came off my table in place of the table runner I found at the antique store. The tag on it says it was hand-spun. I like it. We’ll see if this new table runner stays or if I revert back to the leather. I like it, so far, and it does fit with the bandana napkins. Speaking of bandana napkins, I found some at Porter’s here in town and bought a couple. They were only $1.99 a piece and they had a good selection of colors. While I do like them, they do say, “Made in China” on them. Please, someone, tell me where I can get colorful bandanas that aren’t made in China? I’d love to get some made in America. Thank you. My babies loved it and asked me to find another one. Since I was surprised to find this one, I doubt I could find another. We finished our drive and, as is typical of younger people, they forgot to keep looking for more. 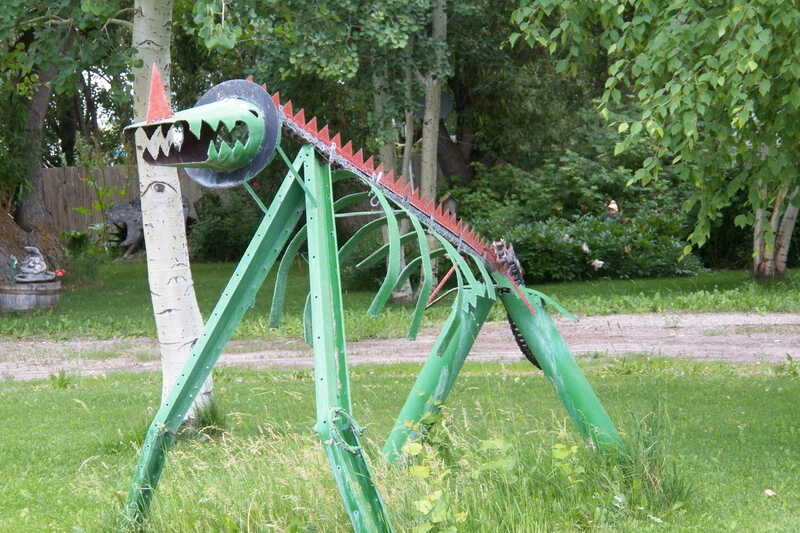 However, this was a very unique idea for a lawn ornament in the middle of nowhere. I wonder if the family that lives here makes them for sale. Not that I want one in my yard! I’m just curious! Speaking of curious, we saw quite a few farms while we were driving around. I was wondering if I could find any of these country living wives that would be willing to tutor me on some of the things I’ve grown up not knowing. If you know of anyone (local to me) that would be interested in being a tutor – giving me hints, tricks, tips, showing me gardening, please let me know! My back yard is coming together nicely. We planted one bush and moved one baby bush from one part of the yard (we were surprised to find it) to the corner I’m building as a “Mommy Retreat.” Doesn’t matter what I say, though. The boys already consider that new mini-deck as their play area. Yesterday, I was Wonder Woman delivering food to them on their “island.” I had to “swim across the water (grass)” to deliver it. 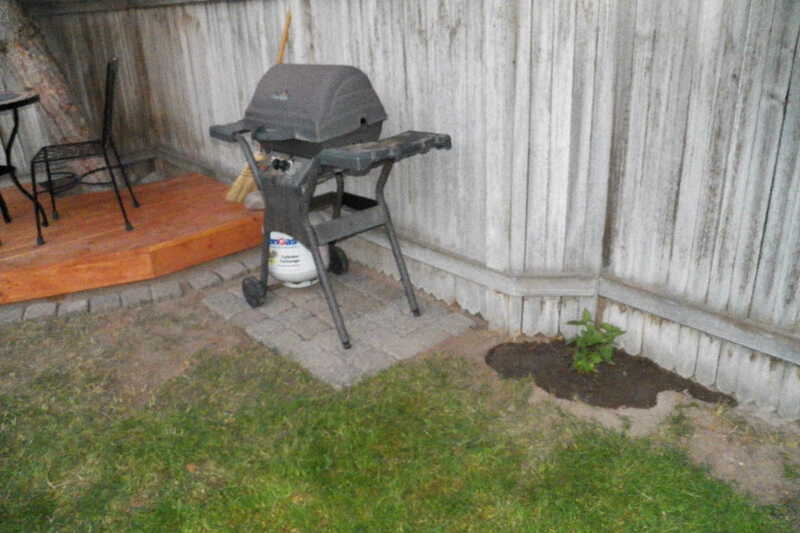 To the left over there, you can see the small bush I planted. Tonight, we finished the blocks for the grill to sit on. It’s effectively away from the house and quite cute back there. 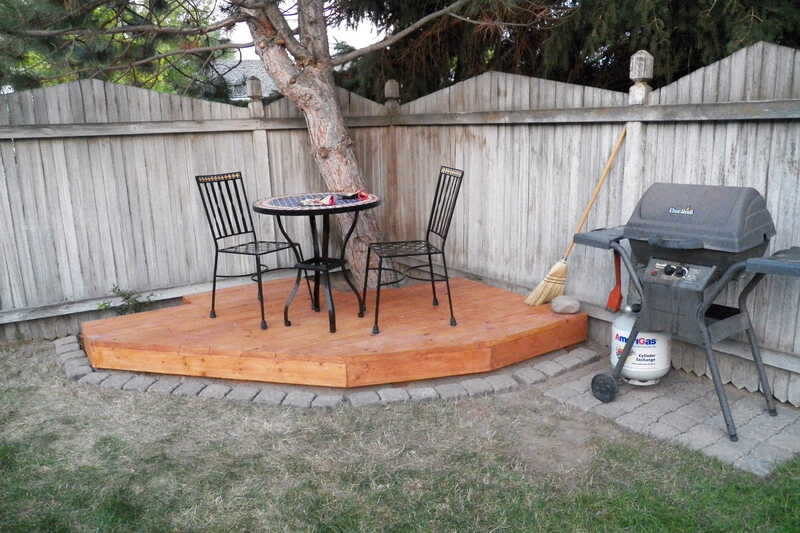 I have to find a way to get the grass to grow around this whole set up to make it really look great, though. 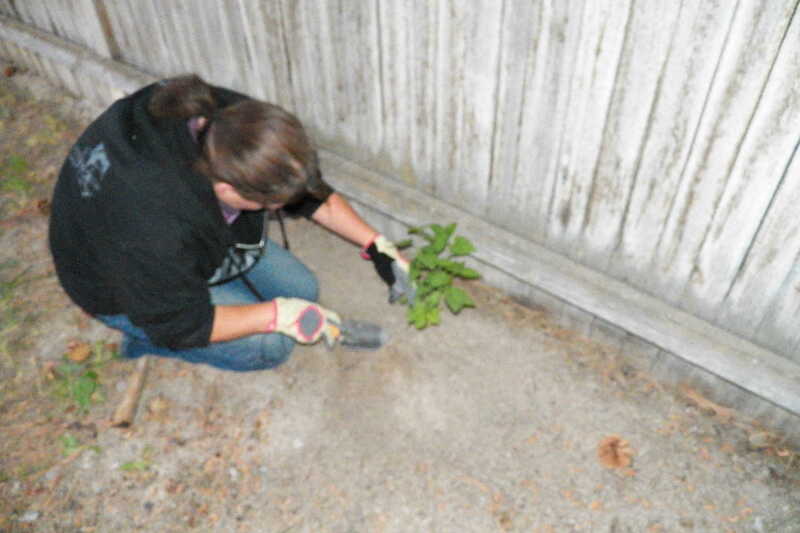 Digging up a bush we found under the other set of pine trees we have on the property. Oh, and by the way? I’m new to all of this. I’ve never cared about flowers, bushes, trees, cleaning up a yard. None of it. I’m learning as I go! However, moving into this house with a such a terribly neglected yard spurred me into trying my hand at this. Replanted, fertilized and watered. We’ll see if will grow and help me get that section of the yard looking like what is in my head. I’ll keep you updated on how things go! If you have any tips/tricks/hints, feel free to share them, please.